Patrick and JB always do the right thing. Well, when you recommend ALL of the movies, there's a good chance we'll get to some by default. Very good podcast :-) Spike is a very underrated director and it's often overlooked how entertaining and rewatchable his movies are. I was at the Sci Fi Spectacular briefly (I came straight from the Bulls playoff game where Rose got hurt...going straight into Brazil was a not the tonic I needed)and I thought the event was pretty awful. Music Box seems to have better quality control. The Portage always screws movies up even though I love the theater and would be sad to see it go. Lastly, I think 12 Monkeys is better than Brazil (in my humble opinion) because of Bruce Willis' performance. It's warm where the rest of the movie is cold so it gives you a reason to care. Brazil is supposed to be bleak and dystopian but I feel it's punishing to me as a viewer. It's too relentlees (kind of like Pink Floyd: The Wall). I respect the movie but I do not like the movie. Thanks, Adam! Great to hear from you. There was a lot that was frustrating about the SFS. I actually almost left during the break in Night of the Comet when they started doing the auction (not the time! ), but my desire to see a 35mm print of the WHOLE movie won out. Turned out to not be a big deal, but I was bummed out at the time. I agree that Music Box does run better, but maybe this was just a fluke? Sounds like not? While I prefer Brazil to 12 Monkeys, I can understand feeling oppressed by its tone. What draws me in is the movie's humor (which I think is what gives it warmth, though I agree that Sam Lowry isn't quite as sympathetic a protagonist as Bruce Willis, if only because we don't get to know much about him) and the pure expression of Terry Gilliam as an artist. So much of Brazil reflects how Terry Gilliam sees the world; it's like watching Raging Bull as a means of understanding Scorsese's worldview. What I'm saying is that I TOTALLY get the respect-but-don't-like reaction. You know that horrible scene in "Spiderman 3" where Venom meets up with Sandman in the alley and they decide to team up? 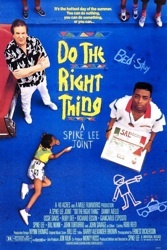 I always thought that was a poor remake of the one in "Do the Right Thing" where Buggin' Out meets up with Radio Raheem in the alley. Hilarious. And it forces me to rethink the whole "BLACK suit being evil" thing. Spider-Man 3 is totally racist, yo. Wait, did I say racist? I mean sucky. In the spirit of that old "Capcom Versus Marvel" video game, I say we let the two teams fight it out. Sandman and Venom versus Radio Raheem and Buggin Out. My money is on Nunn and Esposito-- two PROUD black men. Ive never seen this movie, but how you and JB break it down makes it sound so damn interesting. Man, I hate when this happens (i.e. very damn time). You cover a movie that I havent seen, I think to myself that ill listen to the show anyway because its bound to be interesting and entertaining in itself and ill at least get 20-30 minutes of "Have you seen anything good lately? ", and if I havent seen the movie yet then ill probably never see it or at least no time soon, so hearing spoilers wont be a big deal. Then I get so pumped to see the film that I want to watch it straight away and usually do, all spoiled. Alright. I have to see this movie. Very good. But now I think I need to listen to the podcast again to have it in context. I dont see how Mookie's actions viewed as doing the wrong thing or even questioning whether it is or not is the racist stance of the film. At this moment (and granted I only just finished watching it 5 mins ago) I can only really see Mookie's actions as far more wrong than right. Which probably says more about me than the film, and I dont mean that in a racial/ist way. The way I see it is Mookie's character is one that sacrifices/ignores/neglects his personal relationships for a bigger picture, whether that is his partner and son for getting paid or his Pizzeria Family for the stance of his racial community. And I tend to think that the qualities of an individual are measured by their relationships and treatment of others above all else. Sure, you could see Mookies behaviour as standing up for his community and/or reducing racial tension in the longrun by driving out the Italian representatives. But you could also see it as succumbing to peer pressure/mob mentality. and in doing so he went directly against his "family". True Mookie never said, as far as I can recall, that he saw Sal as family and that he most likely had no positive feelings towards Turtorro, but he certainly had more of a relationship with Sal and Vito than he did with both the younger and older black groups seen in the film. Early days of me processing this film. I may come to the eventual conclusion that I am a big fat racist and that community (as defined by race) above the individual is the right thing to do...but I doubt it. Great stuff in here, really playing to JB's strong suit. Great point about that reverse shot reveal near the end. Sort of wished you had gone on rather than cutting yourselves off--not for lack of content, I just can't get enough F This Movie.